Discover the most exotic monument of Madrid on this 60 minute tour. Visit the 2000 years old egyptian temple of Debod and the egyptian style garderns around it. Enjoy the stunning view over the Cathedral, the Royal Palace and Casa de Campo. Meet your guide and start with a safety briefing and a short training session. Start the tour passing by the beautiful chuch of Santiago and Ramales Square. Explore the Orient Square and enjoy the view of the statue of King Felipe IV with the XVIII century Royal Palace at the back. Discover one of the oldest monastries of Madrid "Monastry of la Encarnación" and reach Plaza de España, where the monument to Cervantes stands surrounded by once the highest buildings of the city: the tower Madrid and the building España. 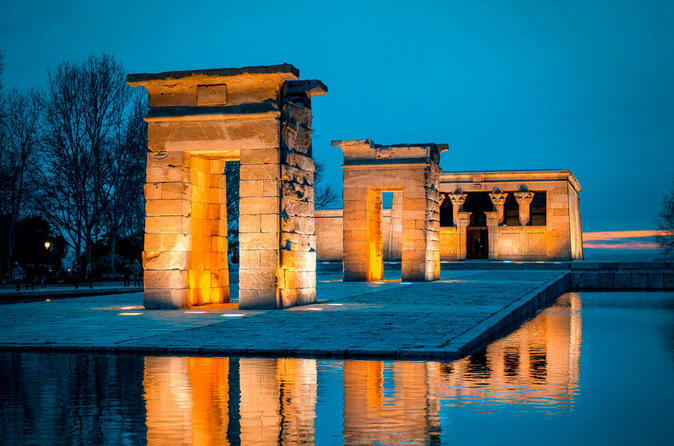 Admire the egyptian temple of Debod, the oldest construction of the city. Given to Spain by the egyptian government as a sign of gratitude, its the only one of its kind in the whole country. The temple is located in one of the highest points of the city. Enjoy the stunning views over the Cathedral, the Royal Palace and the biggest urban park in Europe: Casa de Campo.